Bainbridge Clay Coated Foam Board offers an easy way to mount photos or DIY projects. The FOMC18 board measures 18" x 24" and is clay coated for an extra smooth surface. 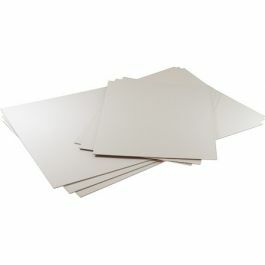 Dual-sided in bright white, this board is lightweight but rigid enough to resist dents to keep your work looking sharp. Ideal for non-archival mounting or as backing for picture frames, this board also works well for school presentations, craft projects, or event posters. The board is 3/16" thick and is easy to cut with a craft knife or mat cutter. Cuts clean and crisp edges every time! Outer Dimensions: 18" x 24"
Provides a non-archival mounting surface for an 18" x 24" product.